The 102P is a very adaptable intermittent motion sachet machine, which can produce sachets in 2 lane, 4 lane, 6 lane or 8 lane models, from 30mm x 30mm up to 160mm x 220mm. The larger the width of the sachet to be produced reduces the number of possible lanes. The machine is PLC controlled and has a touch screen for machine access and operator functions. The operator uses the same touch screen, to simply make bags or fill bags. The sachets can be cut individually, in pairs or in strips as required. The machine can pack many different products, such as powders, granules and liquids or creams. 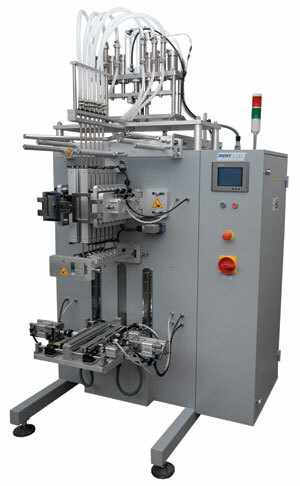 The 102C is a very adaptable continuous motion sachet machine, which can produce sachets in 2 lane, 4 lane, 6 lane or 8 lane models, from 30mm x 30mm up to 160mm x 220mm. The larger the width of the sachet to be produced, reduces the number of possible lanes. The machine is PLC controlled and has a touch screen for machine access and operator functions. The operator uses the same touch screen, to simply make bags or fill bags. The sachets can be cut individually, in pairs or in strips as required. The machine can pack many different products, such as powders, granules and liquids or creams. Similar to 102P but faster.